CARLA PERROTTI, THE ‘LADY OF THE DESERT’ COMPLETES HER HISTORIC SOLO WALK ACROSS THE LIBYAN DESERT. 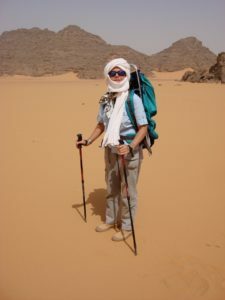 Famed Desert Explorer walks across the Sahara portion of the Akakus Tadrart of Libya’s Desert for the cause of ‘Peace in Africa and the World’. 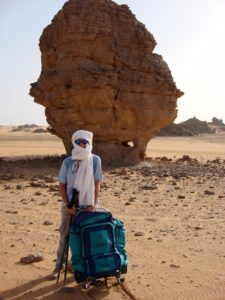 In the aftermath of an exclusive press briefing for journalists at the African International Media Summit (AIMS 2008) in Tunisia, world renowned desert explorer Carla Perrotti has completed her historic solo walk across the Libyan Desert in the area of Akakus Tadrark. Ms. Perrotti, crossed 5 deserts in 4 continents and her daring desert sojourns have earned her a global following, has gone where few humans have before: into some of the world’s most foreboding desert wastelands.